Open Source programs are programs designed and made available by people who wish to have an alternative to a mainstream application. A really good launching point for finding an open-source alternative to a product you would normally have to purchase in the box store or online is at Sourceforge.net. Sourceforge.net may be the largest open-source development site available on the internet. A good example of a popular "Open Source" program is Mozilla's Firefox web browser. We'll try to include a list of common alternatives for some popular purchased software. We discussed OpenOffice.org in our Office Productivity column. OpenOffice.org is a very complete alternative to the Office suite from Microsoft. OpenOffice.org is here. A very helpful feature of OpenOffice.org is the ability to save documents in any of the most popular document formats. 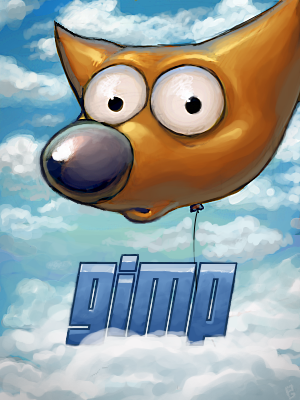 The Gimp is an open source alternative to Adobe Photoshop. It can be used for advanced image editing, importing scans, etc. The Gimp can be found here. Inkscape is a solid replacement for Illustrator or CorelDraw used as a vector graphics editor. Learn more and download Inkscape here. Scribus is a fully functional and powerful Desktop Publishing application similar to Indesign Page aker or Quark Express. Documents can be exported to PDF or SVG and Scribus' native file types. You can find more information and the download here. Nvu is a fully functional web authoring application. It's a good substitute for Dreamweaver or FrontPage. You can find NVu here. PDFCreater allows a user to create a static file viewable from Acrobat Reader. Have you thought your computer has needlessly slowed down? Here is an excellent way to clean up or reorganize the file structure of your Windows computer files. Over time Windows will copy your files on your hard drive into any space that is left available. Eventually, the drive will be working so hard to manage the files on your hard drive that it makes Windows slower. It's a pain to have to remember to run de-fragmentation often to help keep the files cleaned up. Smart Defrag does the de-fragmentation for you. Once installed it will manage where files are on the hard drive and keep the disk and Windows working faster and more responsively. There is an automatic scanner and some manual scanning available to get the best performance from your hard drive. Check out Smart Defrag find out more about this essential tool! Use CCleaner to keep your system temporary files cleaned out and improve performance and disk space. Also, run the Registry Cleaner to help improve Windows Start up and Shutdown times. You can also use the Uninstall and Startup menus to clean up unused or outdated applications. For some of you saving your data (files, pictures, etc.) is a nearly life threatening risk if you lose it. SyncBack is a free backup solution. It is very configurable. You can set a schedule for running the backup any time you need to. Also, you can select what type of backup you need, such as, a whole computer backup or just certain files. It will also perform an incremental backup, meaning it will detect if you have already backed up certain files and not overwrite them. You can download the SyncBack Freeware installer here. Are you looking for a simple DVD player for your computer? The open source Media Player Classic is your answer. It will play nearly any media type and includes codecs for your DVD reader. Two tools for backing up your prize collection of DVDs at home are DVD Shrink and DVD Decrypter. Both of these programs enable the ability to make a copy of a DVD onto your hard drive. Remember, this is for your personal use only. Never copy DVDs to share with your friends or sell, that is illegal. Click on the links for DVD Shrink and DVD Decrypter to access the installers. Imgburn is a fully functional CD/DVD Burning application. You can copy to and from CDs or DVDs, create ISO files for backing up disks or just back up files from your computer. It's extremely interactive yet simple. Read, learn and download ImgBurn here.